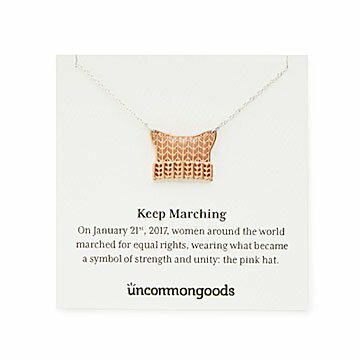 This textured pendant in rose gold-plated brass is a beautiful, subtle reminder of the Women’s March. On January 21st, 2017, women around the world marched for equal rights, wearing what became a symbol of strength and unity: the pink hat. This textured pendant in rose gold-plated brass is a beautiful, subtle reminder of that history-making day, when hundreds of thousands stood for affordable birth control, equal pay for equal work, full access to health care for transgender Americans, and more. It's a unique keepsake to wear as personal inspiration to keep marching forward for equality. We donate $5 to our Better to Give partner, RAINN, for every necklace sold. Made in Erlanger, Kentucky. On our blog, find out more about what the Keep Marching Necklace means to us—and to the women who designed it. Not as pink as it looks in the picture, more of a copper color. Was a meaningful gift for my friend. Great gift idea! Very pretty. My Go-To gift for the progressive women in my life! I love this necklace. So pretty, unique, and meaningful. 'My person' marched and will wear in proudly! It is one of the few things that will strike up conversations about women's rights. I like to wear this as an everyday piece. It's just the right length and the chain is stronger than it looks online and has a little sparkle to it. After two weeks, the hat itself lost its pinkish color and now looks more like a copper penny but I still love it. Now I must buy 2 more for the next Women's March. The recipients for the first 2 loved them. My friend was thrilled to receive this! It is pretty and unique and perfect for my friend. I love it, I would buy it again. A great remembrance of Activism at a young age and the hope for more in the future.